The Divergent Life: Rumour Round Up: Colton Haynes & Alexander Ludwig up for the Role of Four? 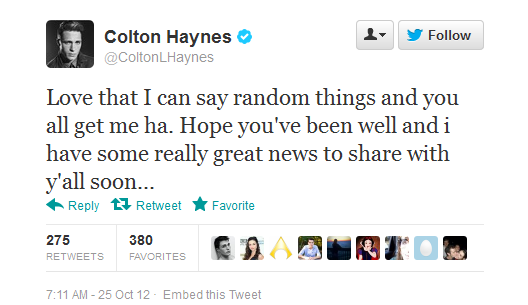 Rumour Round Up: Colton Haynes & Alexander Ludwig up for the Role of Four? Here are the latest rumours regarding the casting of Four. 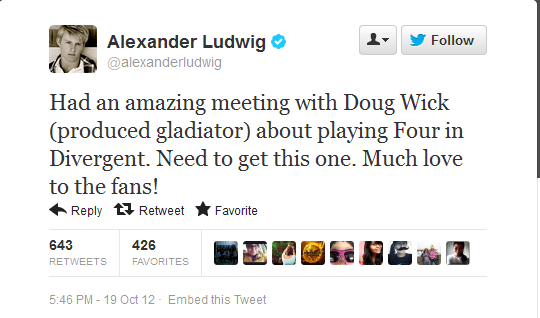 First up, Alexander Ludwig (The Hunger Games) tweeted about having a meeting for the part, obviously keen to get the role. However, yesterday morning Colton Haynes (Teen Wolf) sparked a whole load of intrigue by following Veronica Roth on twitter, and then tweeting the message below. Very interesting! watch this space.